BMW Andretti driver Antonio Felix da Costa tells Nicki Shields about his persistence and drive in Formula E even when he struggles in getting results. 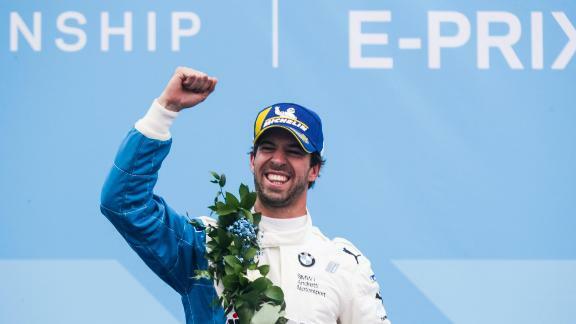 Formula E driver Antonio Felix Da Costa says the feelgood factor in the paddock has helped him out of the doldrums and back into form after a four-year winless drought. The Portuguese driver claimed his first victory since January 2015 at the season opener in Saudi Arabia in December and is targeting further success in 2019. Da Costa held off defending champion Jean-Eric Vergne to take the checkered flag in Riyadh and spark wild scenes of jubilation on an emotional day both for him and his teammates. "It has been nice because a lot of people who are there with me have struggled like I have," Da Costa told CNN ahead of the season's second race in Marrakesh earlier this month. "I was pleased for myself but also the team around me. I saw some tears from some of the old boys." For Costa, the victory brought an end to a difficult four years in which he had often left the track frustrated after failing to secure a single victory since his triumph in Argentina. The past four years have been a test of perseverance for Costa, who says he had offers from seven teams to move on from Andretti following a frustrating time in the sport. But the arrival of BMW has transformed not only his perspective on racing but his chances of winning too. "Even after all those bad days, I had a small light at the end of the tunnel which was season 5 with a manufacturer with a good car, and I stuck with it," he said. "The core thing is to have core people around me, even on my technical side. "My engineering group, my small core group of people, we get on well, and they've seen me do well before so they know what's going on. "I also did some racing outside of Formula E -- some one-offs. Actually I had a late call to go back to Macau in 2016 or 2017 in F3 -- and I won it. Small days like that that I can tell myself 'you can still drive.'" "I am committed to this project and I'm glad to see it pay off -- but it was a long time of suffering and I am so glad we did it in Riyadh. "I can now tell everyone in BMW in Germany: 'OK let's get everything out of our minds, let's work as hard as we can because we can all do it.'" Da Costa will be hoping to gain a second victory of the season in Chile this weekend after crashing out in Marrakesh last time out. Leading the race with 10 minutes remaining his BMW i Andretti teammate Alexander Sims attempted a pass round the outside that resulted in both cars locking up and Da Costa hurtling into the wall, though after the race the Portuguese driver said it had been his mistake and apologized to his teammate. The next race takes place in Chile's capital Santiago on January 26. Tracking a rainy start but sunshine will return! Dr. Oz - Do you have acid reflux?